Currents reflect the horizontal movement of water whereas tides reflect vertical movements. These currents influence the ship's position and are therefore important to understand. the Coriolis force which is a consequence of the earth's rotation. 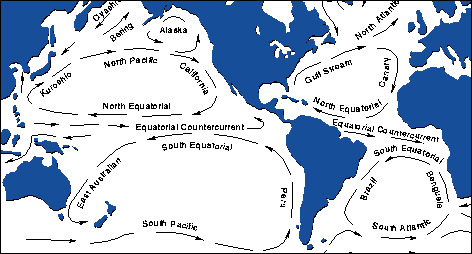 Prominent features in the map of the major oceanic surface currents include the subtropical gyres centered on 30 degrees latitude in each of the major ocean basins. The earth's rotation (origin of the Coriolis force) and the change in wind direction with latitude (from the east in the tropics and from the west at mid-latitudes) cause the circulation of the gyres to be clockwise in the Northern Hemisphere and counterclockwise in the Southern Hemisphere. Click chart to see the whole world! The well-known Gulf Stream in the Atlantic and its counterpart in the Pacific, the Kuroshio Current, are strong currents that carry heat northward from the tropics. The deep oceanic currents (not shown) are caused primarily by water density differences and in general return the (now colder) water back towards the tropics. To predict the behavior of major ocean currents several references are available. The Sailing Directions Planning Guides contain some information on normal locations and strengths of ocean currents. Nevertheless, the Pilot Charts are by far the best reference for predicting the direction and speed of these currents. On these charts, arrows indicate the direction of the prevailing current; a number printed above the arrow indicates the average speed. Since this information is based upon historical averages, it won't predict the actual ocean current encountered with 100% accuracy. Ocean surface currents need not be considered in coastal areas. Tidal streams are described by drift/rate and set, in which drift/rate is the speed and set is the direction of the current. In order to predict tidal stream one needs to use tide tables in conjunction with a tidal atlas, or a tidal diamond. Tidal diamonds are symbols on the nautical chart that indicate the direction and speed of tidal streams, consisting of a capital letter inside a rhombus ♢, both in pink. 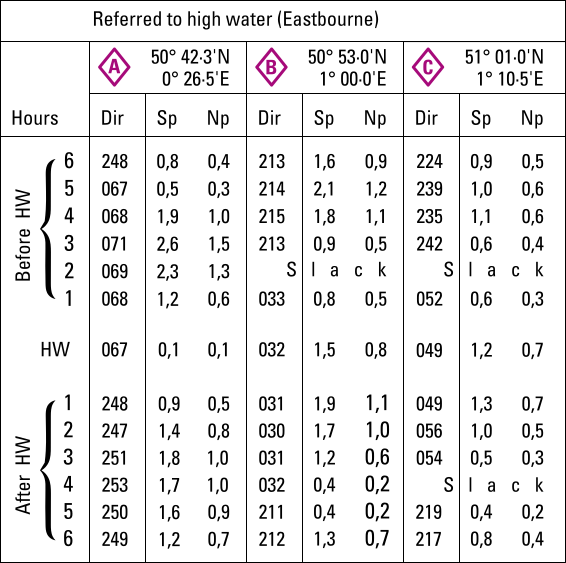 On any particular chart each tidal diamond will have a unique letter starting from "A" and continuing alphabetically. Somewhere on the chart, generally on land, will be a tidal diamond table. The tidal diamond table contains a grid of thirteen rows and three columns for each Diamond. The three columns show the bearing|set of the tidal stream and its speed|drift|rate, in knots, at both spring tide and neap tide. The thirteen rows are the hours of the tidal cycle showing the 6 hours before high water, high water itself and the 6 hours after high water. The times on the table are related to the high water of the standard port or reference port. In this case Eastbourne harbour in England. There can be a LW slack water before flooding and there can also be a HW slack water before ebbing: the tidal flow turns and changes direction. During ebbing and flooding the rates are strongest. An alternative to a tidal diamond is a tidal atlas which are often more accurate and easier to use, yet not always available. Tidal stream atlases show the tidal currents for each hour of the tidal cycle. They comprise a total of 13 tidal charts ranging from 6 hr before HW till 6 hr after HW . So, these charts are relative to the time of HW and to use them we must know the absolute time of HW. Though several layouts can be used, usually the direction of the tidal stream is shown by arrows, which are heavier where the tidal streams are stronger. Figures against the arrows give the mean neap and spring drift or rate in tenths of knots. For example, indicates a mean neap drift of 2.1 knots and a mean spring drift of 4.6 knots. The Course to Steer process, where you know your present position and required Ground Track. You want to find the Course to Steer to allow for the tide, and stay on the Ground Track.